Pfffft! - A noise that no biker likes to hear coming from his wheel, since if that is the case, the air is not just proverbially "out" but the air really is out of the tube and the tour and maybe even a race is being interrupted in no nice way. Whoever intentionally does not ride tubeless and still counts on the proven technology of the inner tube, should still be concerned when choosing the comparibly more favourable part since a fitting tube is an important component of an efficient entire package. And if you choose correctly - it will keep you from having to change the inner tube too often. In terms of inner tube materials, butyl prevails against latex since it is less complicated to handle. Latex might have the better protection against punctures due to its elasticity and it reduces the rolling resistance, but it reacts sensitively to heat and most of all more air is diffused into the air through latex, causing you to pump up your tube again literally before each ride. Butyl can keep the air remarkably longer. Inner tubes of butyl are not impervious to heat either, but if a latex tube is exposed to heat, a rim brake can suddently rip the tube (e.g. going downhill with a road bike), and this can become quite dangerous. Of course, you won't have this problem with disc brakes, and that is why latex is still quite popular with racers. Different sizes of inner tubes - what is the "ETRTO"
So if you know your tire width and thus find a selection of fitting inner tubes, you now have to ask yourself the question of the robustness. Here it applies first of all that a heavy tube with more material is also more robust. Whoever has a clean driving style and does not carefully approach the last tenth of a bar of air pressure, but loves low rotating masses and accordingly a good acceleration instead, can also do very well with a light tube without significantly more breakdowns. Furthermore, you have to pay attention to the fact that a tube is much more susceptible to damages the more tensioned it is. So if your tire width is in the lower limiting range of the tube, the tube does not have to expand that much in order to fill the wheel and tolerates e.g. punctures more likely due to the low material tension. But then, you will have to take more care when installing the tube not to jam the tube. AV: the autovalve, also known as Schrader valve or American valve. It is a little more heavy than the French valve but it can simply be pumped up at every gas station. For changing over from SV valve to AV valve, it might be required under certain circumstances to enlarge the valve bore. For this operation please contact a professional mechanic! SV: The Sclaverand valve is also called "French valve". It is light, does not require a special bike tire inflator head, which a modern bike tire inflator normally features. If you have an AV valve, it generally should be no problem to change over to SV since the bore is large enough. DV: The Dunlop valve, which is also called Woods valve. Especially road bikers have to pay attention to another property when choosing valves: The valve length! For high-profile aero rims, you will need a longer valve so that enough length of the valve head will protrude from the rim so that the tire inflator can be used. As a rule of thumb, the valve should be 15 mm longer than the rim height. 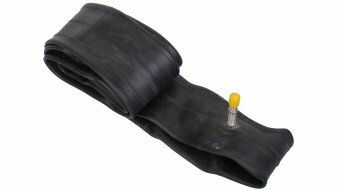 Generally, SV inner tubes are being used on the road bike. Tip: Whoever comes from somewhere close to our bike shop in Kronberg or who is on the road around here, can get a Continental replacement tube from our "tube dispenser" around the clock, 24/7. Just put in your money, choose a tube, take the tube with you, ready.